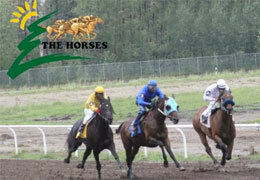 Evergreen Park hosted four trials for the Bonnett & Brodon Futurity Monday's race card. GRANDE PRAIRIE, ALB�AUGUST 4, 2014�Trainer Kurt Calton and jockey Larris Allen teamed to qualify three WAVE CARVER two-year-olds, including the top two finalists, to the Bonnett & Brodon Futurity Monday at Evergreen Park. All three were bred in Kentucky by Shady Lane Stables are raced by Janis D. Calton, Lessee. The eight fastest from the four trial races will return to the Alberta Canada racetrack Sunday August 17 and vie for the winner's share of a $10,000-added purse going 300 yards. Stella Wave, a WAVE CARVER filly out of Special Corona by Corona Cartel, kicked-off the afternoon with an impressive 1� length victory in the first trial to set the top qualifying mark of :15.620 seconds, a 97 speed index. Coming off a runner-up finish in the John Deere Evergreen Juvenile Challenge on July 27, the chestnut filly broke her maiden in her fourth career start. An earner of $8,847 this season she has put together a (4) 1-3-0 record. Calton and Allen book-ended the trials by taking the final trial by half-a-length with Raging Wave. The WAVE CARVER colt posted the second fastest qualifying time of :15.708 seconds. Raging Wave, who was third in the aforementioned John Deere Evergreen Juvenile, also broke his maiden with the trial victory. The $5,820 stakes-placed earner is 1-1-2 in five starts this season. Raging Wave is out of the Special Task mare Rosas Special. The other Calton/Allen qualifier was the WAVE CARVER filly Wave Rocker, second by a neck to Red Armor in the second trial. Out of the Chicks Beduino mare Sheza Special Chick, the gray filly was making only her second career start in the trials. For the complete list of Bonnett & Brodon Futurity finalists, times, sires, dams, owners, breeders, trainers and jockeys CLICK HERE.